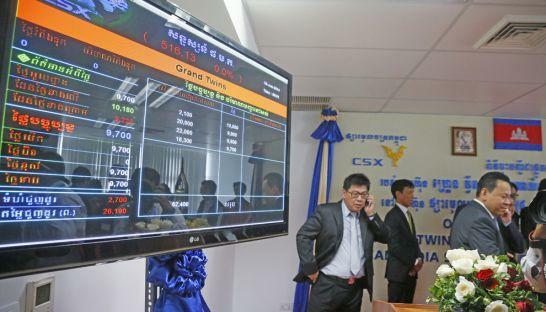 The Cambodian Securities Exchange (CSX) granted its approval for an initial eligibility review for Pestech (Cambodia) Ltd to be listed on the bourse. Cambodia’s fledgling stock exchange could receive a much-needed boost after Malaysian-owned power infrastructure provider Pestech Cambodia officially submitted its application for an initial public offering on the CSX, industry insiders said yesterday. Malaysian power infrastructure provider Pestech International plans to list its wholly owned Cambodian subsidiary next year in a bid to raise a cash equivalent of $18 million to expand its presence in the Indo-China region, according to Japanese media reports. In a move to urge small- and medium-d businesses to list on the Cambodian stock exchange’s Growth Board, more than 70 companies have joined a new initiative offered by the market regulator that will provide professional guidance on how to meet listing criteria, paving the way to having a first listing sometime next year. Real estate firm Century 21 Mekong, one of nearly 20 independent real estate offices operating as part of the Century 21 franchise in Cambodia, plans to float shares on the stock market to raise funds for expansion, a company executive said yesterday. Malaysian power infrastructure provider Pestech International is looking to establish its Cambodian subsidiary as a top player in the local energy market, and operate it as a hub for regional expansion ahead of its planned listing on the local stock exchange, a company spokesman said yesterday. Malaysian power infrastructure provider Pestech International has announced plans to list one of its indirect wholly owned Cambodian subsidiaries on the local stock exchange. Hong Kong-based developer Eastland Development (HK) Ltd has expressed interest in listing on Cambodia’s stock exchange within a year.